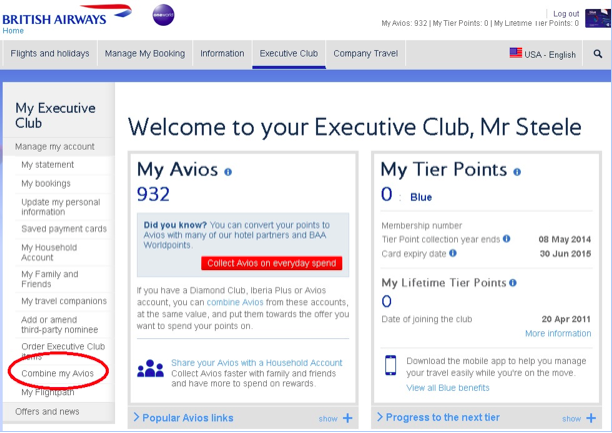 TPG contributor Jason Steele (and a lot of other frequent flyers) have found it impossible to move Avios between their British Airways and Iberia accounts recently. Here’s the way he found to work around the problem. The British Airways Executive Club can be an incredibly valuable rewards program, but it is crippled by the outrageous fuel surcharges imposed on flights operated by British Airways and many of its partners. Surcharges on business and first class tickets can be approximately the price of a coach ticket, and there are even cases where the fuel surcharges on a coach ticket can approach or exceed its cash price. 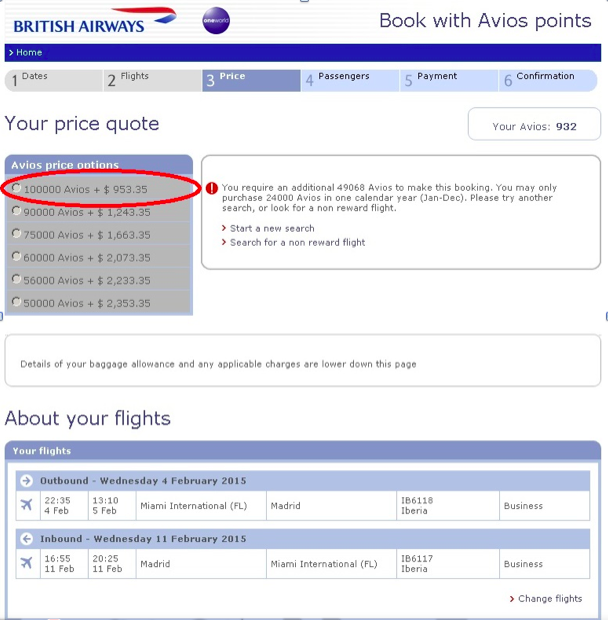 The trick to getting the most value from your British Airways Avios is to focus on the partner award flights that it doesn’t add fuel surcharges to. These flights include those operated by Alaska Airlines, Aer Lingus, Air Berlin, LAN (international), S7, and US Airways. In addition there are exceptions for short haul flights including British Airways flights within Europe and South Africa, Qantas domestic flights, some LAN domestic flights, and American Airlines flights within the Americas. Iberia airlines of Spain is owned by the same parent company as British Airways. Although it operates its own frequent flyer program called Iberia Plus, it also calls its points “Avios.” Like the British Airways Executive Club program, Iberia Plus imposes similar fuel surcharges to partner award flights, but it charges substantially less for awards on flights that it operates (though still some that can be hundreds of dollars on transatlantic flights). For example, this roundtrip flight on Iberia from Miami to Madrid in business class requires 100,000 Avios plus $935 when purchased from British Airways. The very same flight is just EUR 190 (~$263 US) if Iberia issues the award (along with the same number of Avios). That’s a $672 savings per ticket! Not only that, but now that US Airways is a part of Oneworld, you can use Avios to book US Airways awards. However, BA is pricing them out while Iberia is not, so you’ll want your Avios under your BA account if you want to put them to use this way. Fortunately, British Airways appears to offer customers the ability to move points to Iberia Avios, at least under the certain conditions. First, Iberia Plus members must have their account open for at least 90 days. Next, the Iberia Plus account must be “initialized” in some way by having some activity. Having an Iberia Plus account open for more than 90 days, I wanted to transfer points from my Chase Ultimate Rewards account, to British Airways Avios, and then on to Iberia Avios to book four flights to Italy, via Madrid. 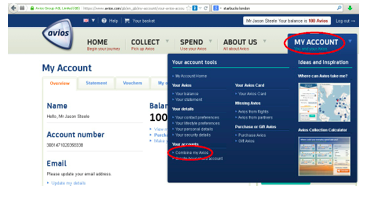 Thankfully, I decided to first test the Avios transfer functionality on BA’s website, called “Combine Avios” before moving tens of thousands of Ultimate Rewards points to British Airways, which is irreversible. First, I had to initialize my Iberia account, which had no activity. To do so, I moved 1,000 points from the American Express Membership Rewards program, of which Iberia Plus is a transfer partner. That transfer took nearly three days to complete. Infuriatingly, clicking on that button only pulls up the same page in a frame within that page, over and over again. So I then tried to pull up the correct page in Firefox using both private browsing and safe modes, as well as in various other browsers, all without success. Finally, I contacted both British Airways and Iberia. Iberia informed me that only British Airways could initiate the transfer. The British Airway representative that I spoke to was happy to help, but she reported seeing the exact same problem on her system. In researching the problem, I came across several threads on FlyerTalk that indicated that this is not a new issue. While some posts referred to workarounds that I had already tried, and others that just didn’t pan out, one post briefly mentioned using Avios.com. 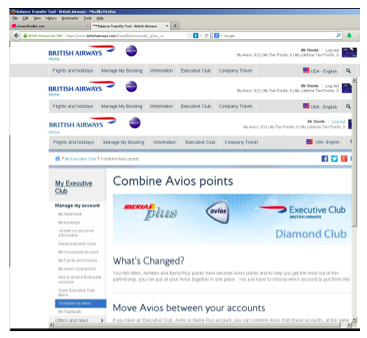 This started to make sense as the Combine Avios feature on BritishAirways.com was supposed to work not just between BA and Iberia, but also with Avios.com as well as something called the Diamond Club. The Diamond Club is a largely defunct credit card rewards program that originated with BMI, an airline that was purchased by BA’s parent company in 2012. 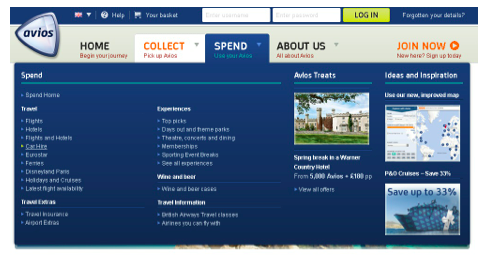 On the other hand, Avios.com is an active program that offers shopping and travel rewards to residents of the United Kingdom and South Africa. 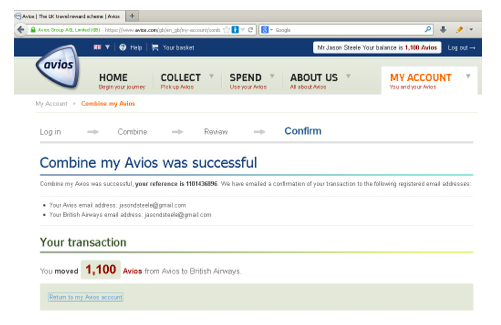 After creating an account at Avios.com, using a fictitious address in England, I was eventually able to transfer points between my Avios.com account and both my British Airways and Iberia Avios accounts. 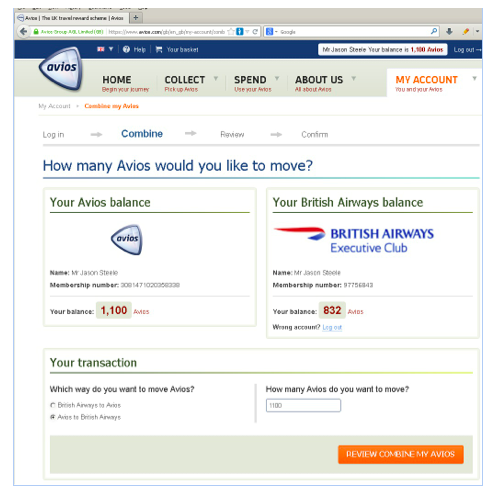 I verified that transfers can occur in both directions between BA and Iberia in two steps, by using an Avios.com account as a go-between. Transfers worked in both directions and were instantaneous – like they’re supposed to be. While it seems simple enough to transfer points from British Airways to Avios.com and then to Iberia, it took me a few tries to get it right. To save yourself some time, make sure that your email addresses in your personal profiles match, and that you have your birth date entered into your profile with both programs. The moment you execute the transfer, you will receive a pair of confirmation emails from the programs involved in the transfer, even before the website itself confirms the transfer. 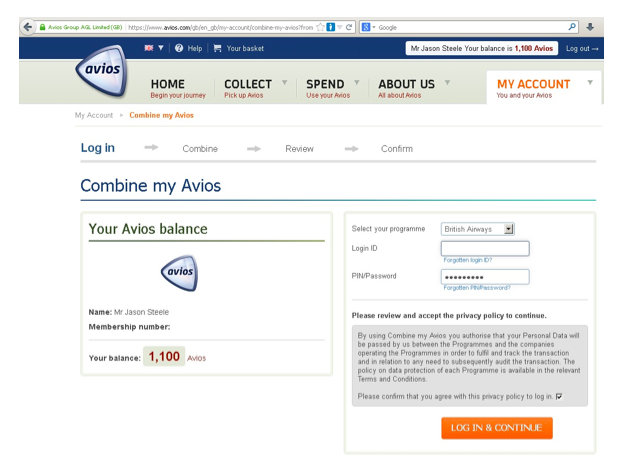 In my experience, I also had to log out and log back in to Avios.com in order to see my updated points total. 1. Award flights on Vueling. Vueling is a Spanish low-cost carrier that serves dozens of destinations in Europe, north Africa, and the Middle East. However, Vueling award flights can only booked with Iberia Avios, not British Airways Avios. 2. Award flights on Aer Lingus and Alaska. Iberia Avios cannot be used to book flight on Aer Lingus or Alaska Airlines, which are partners of BA but not Iberia (don’t ask me to explain it!). 3. Capitalizing on Membership Rewards Bonuses. Although BA and Iberia are both Amex Membership Rewards transfer partners, American Express offers fairly frequent bonuses when transferring points to BA. 4. Combining small balances. 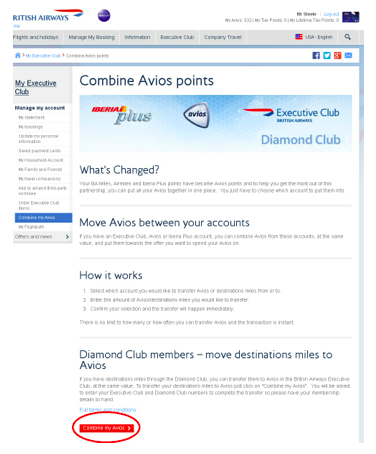 If you have a small amount of points with either program, you can use these points for the purpose implied by the phrase “Combine my Avios,” and put otherwise orphaned Avios to use. 5. Earning Avios points in the UK and South Africa. If you actually live in the United Kingdom or South Africa, you can earn points with Avios.com when shopping, buying gas, and even recycling your old electronics. You can then transfer these points to Iberia or BA for use with award flights. 6. Avios.com awards. Avios.com offers some interesting awards that you can’t get with either the BA or the Iberia Avios programs. For example, you can use points to book a Eurostar train, rent a car, or get tickets on one of a number of ferries. 7. Various discounts. Earlier this year, Iberia had an award sale where it offered a discount on the number of Avios necessary for certain flights, which were not available using BA Avios. 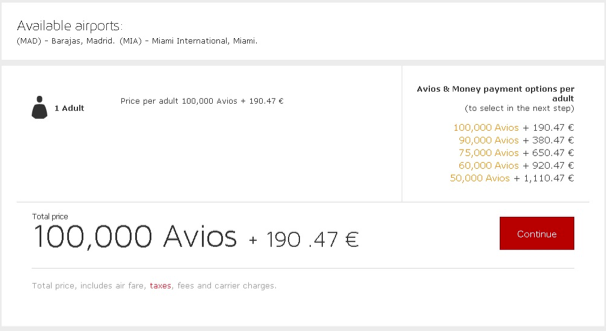 Iberia also prices out more award availability at more levels on its own flights when you use its own Avios, so if you’re looking to get around Spain or Europe on the airline, it can often be worth booking with IB Avios instead of those on BA.